#11 Kansas State beat Iowa State 30-23 in the season finale for the Cyclones. 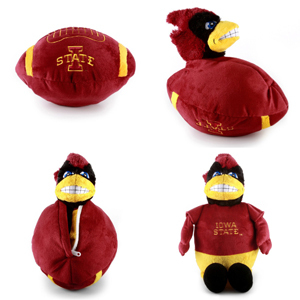 ISU had a chance to tie the game late, but was stopped on 4th and short in K-State territory. 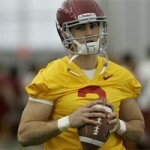 Iowa State fell to the #12 Oklahoma Sooners 26-6 in Norman last Saturday. 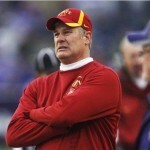 The Cyclones got an excellent effort from the defense in the loss forcing 4 turnovers and holding OU to 26 points. 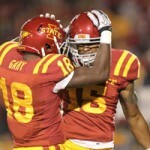 Iowa State defeated the #2 Oklahoma State Cowboys 37-31 in two overtimes. 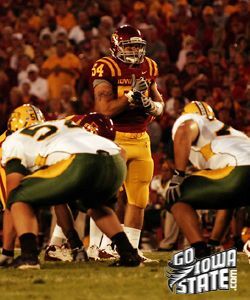 It was the sixth win on the season for the Cyclones, securing the second bowl game in two years for ISU. Iowa State couldn’t overcome several costly turnovers and penalties in a 37-14 loss to the now 11th ranked Texas Longhorns. Check out photos and a recap of the game here. Iowa State overcame a lousy first quarter to get a huge road win at Connecticut. 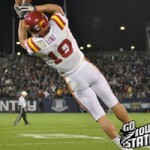 Darius Reynolds and Josh Lenz made big plays in the Cyclones 24-20 victory. 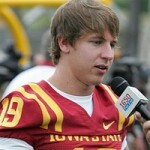 Iowa State held football media day last Thursday at Jack Trice Stadium in Ames, Iowa. 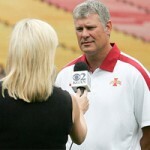 Photographers Reese Strickland and Steve Fry were on hand to get photos of the 2011 Iowa State Cyclones. The Iowa State Cyclones bounced back from a couple shaky outings and played their best game of the year in a 28-21 win over Texas.